Mom, the Intern: Surviving an MRI. Bubby's been at The Happiest Place on Earth for a few days now. It's crazy not having her here. Since Buckwheat is essentially non-verbal, it's eerily quiet. Car rides are especially strange without the constant interruptions of, "Hey Mom, guess what?" And the house is exceptionally clean. I guess we know who makes the messes around here! We do miss her a whole lot. It'll be good to have her back tomorrow afternoon. 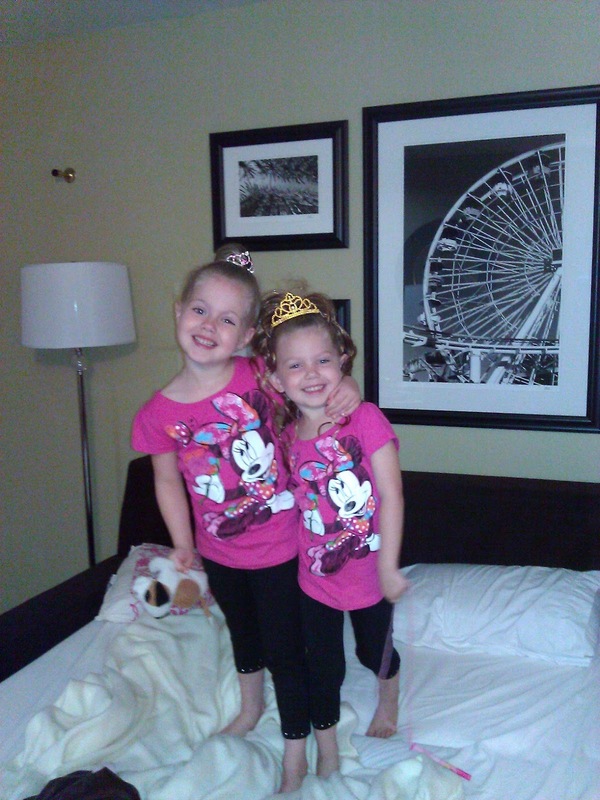 In the meantime, look how cute she and her cousin Kamryn are in their matching Disney outfits! So, yesterday was my MRI. I had been freaking out about it for weeks -- it kept getting postponed and rescheduled, extending the amount of freak-out time I had to endure. So when the day finally came, I was more than ready to get it over with. I'd had way too many people give me well-meaning advice and I still had no idea what I was going to do to calm the heck down once I was in the tube. I showed up to the clinic a half hour early as directed. Not five minutes after I walked through the door, the MRI assistant lady came out and asked me to "come on back." What?! I have paperwork to fill out! And more freaking out to do! I thought. I followed her to a little waiting area that had a few dressing rooms off to the side of it. She asked me if I had any metal in my clothes or hair or shoes -- no, no, and no. Any jewelry? No. I'm pretty good at following directions and they already told me not to wear any metal before I got there. After this assessment, she took me into the room with the MRI machine. The machine is HUGE, but the actual opening where your body goes is super-small. At least it looks that way from the outside. It looks impossible for anyone to fit in there, even a little squirt like myself. I'd had an MRI before, just the other way -- with my head hanging out instead of my feet. She told me to go ahead and lay down on the narrowest platform I'd ever seen and place my head in an uncomfortable-looking cradle. Yay. Then, she handed me some yellow earplugs which I gratefully inserted into my ears. Finally, she wedged some little pads in between the sides of my head and the cradle to hold everything still during the procedure. That was great because they went right against my ears, dulling the sound further. Once I was all situated, she handed me a little pump-like thing to squeeze in the event I was having a major panic attack and needed to evacuate the tube posthaste. How thoughtful, right? Then, she told me Sam (must have been the technician) would periodically update me on the progress of the procedure via intercom. Huge sigh of relief. Most of my fears in life stem from not knowing what to expect or feeling uninformed. If you're ever afraid to get an MRI, this will calm your worries considerably. Ask them to talk you through it. Finally, she said, "Try to keep swallowing to a minimum during the procedure." And then I immediately felt like I had to swallow four gallons of saliva. My mom had told me to just shut my eyes and NEVER open them. That seemed like sound advice. During the first MRI (on my knee), I kept my eyes open the whole time and it was awful. Granted, my head wasn't in the machine, but I felt like I couldn't relax and my mind kept jumping frantically to different points of interest in the room. I felt like a wound-up horse needing blinders. So, this time, as soon as the nice MRI lady started to advance my little platform into the tube, I shut my eyes. I noticed when the room got darker beyond my eyelids, indicating my change in position: I was IN. The. Tube. I first heard the soothing voice of Sam telling me we would begin and to "hold real still." He said I could swallow whenever the machine was quiet, which would happen several times. Oh, good. Because I already have to swallow again, come to think of it. I decided it would be good for the musician in me to instead focus on the rhythms and sounds produced by the machine. I found the beat and started singing various Backstreet Boys lyrics along with it in my mind. Yes, Backstreet Boys. Then, I noticed it sounded a lot like dubstep. Wubwubwubwubwubwubwub. It kind of made me chuckle inside. Backstreet Boys dubstep. I tried not to chuckle on the outside so as not to flip out the machine. It was kind of hard. Before I knew it, the weird dubstep test was over. MRI Lady rolled my platform back out of the machine and said, "We're all done!" I was in one piece, not soaked in my own urine and feeling rather calm. Awesome. I'm not itching to get back in there any time soon, but I know if I should have to get another one, I'll survive. And so will you! My talented friend Lindsey Stirling will show you. Oh I hope I don't have to ever have an MRI because the no swallowing thing would kill me! It's like being at the dentist, where I was this very morning, where I seem to have to swallow every 20 seconds! So glad you got your MRI over with! Hope it gives you some answers. I'm glad you did a post about this! I don't need to get one now or anything but its definitely the type of thing that freaks me out! I did rhythms in my head as well. Before I fell asleep anyway. I had to do a head and neck one right after the other so was in an hour. I had to have a cage thing on my head and it sucked. They didn't say anything about swallowing though. I hate doing tests. It's like when people yawn - domino effect. Or when they start talking to about someone having lice... you immediately start feeling itchy. Haha! Glad it's over...fyi, my dear, addition problems are way too easy to keep your mind off the machine! No, I did math like, "if Scott were to get an X% raise each year for the next five years, how long until we were making Y? How much would our take home go up each year after we factor our taxes? Or up our 401K contributions. Addition...silly girl! At least you found something that worked for you! Yay! MRIs sound so terrible. My mom had one a little while ago that lasted for about an hour and a half. She felt like she was gonna die! Then, when she got out, the nurse congratulated her, "That was amazing! I don't know that I've ever seen anyone do it that long unmedicated. Usually we just knock them out first!" My mom smiled at the lady, and DIED inside. In her words, "I could have been knocked out????!?!?!?!?!?!" Way to go! And that video was amazing.